What brand, size tile and colour r u using? Looks great!!! The size was 300x600 and the colour will now be discontinued, though there will be something similar available. Love the TV entertainment cabinets - Does someone in Western Sydney make these? Fade to black. If you’d rather not go to the trouble of opening and closing doors, cabinetry that gives the TV somewhere to sit but doesn’t hide it away could be the answer. Set a dark TV against a dark wall and it will disappear into the background. 3. Black it outA tried and tested way to make the TV disappear is to camouflage it into the surrounding wall. Paint the back wall a dark colour such as navy, charcoal or warm black – or use wallpaper as in this photo – and your TV will seem to merge into the background. 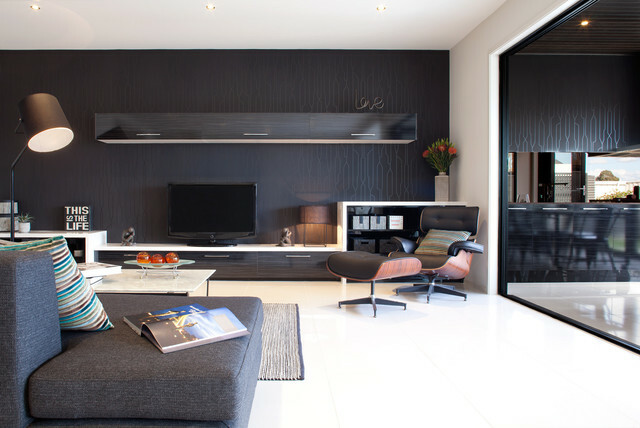 In this living room, the dark feature wall and matching joinery add sophistication and moodiness to the room. This is a good solution for those wanting to avoid the obtrusiveness of TVs and of having to fiddle with cabinet doors.Tip: Use seagrass or a woven wallpaper in a dark hue on the back wall for added texture and warmth.